Nautical lingo, sailing terminology if you must, can seem like an antiquated language used by old salts of the sea just to be difficult! For new-comers to sailing if you want to melt into the scene it really is a good idea to learn the lingo and about sailing equipment. But in an emergency there’s no time to explain sailing terminology so when the skipper instructs you to ‘ease the main sheet’ you know what he’s talking about and can help. Port – the left hand side of the boat also has a red navigation light. ‘There’s no port (red) left in the bottle.’ .... May help jog the memory. 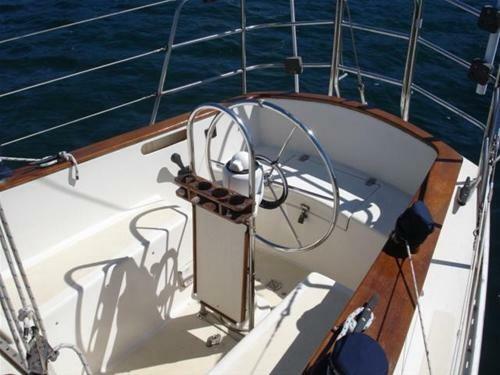 Starboard – is the right-hand side of the boat, (opposite to port) and has a green navigational light. Some sailing gloves have a red strip for the left hand, and a green strip for the right, it’s like having a cheat card. Bow – is the front of the boat, the pointy end. Stern – is the back of the boat and can also be called aft. Boom – this is the horizontal pole that holds the main sail. It moves from side to side to harness the wind. Get in its way and it can be dangerous, it can knock you out and throw you into the sea. 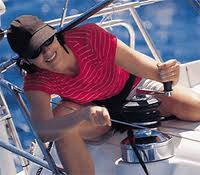 Winch - makes it easier to wind in sails, halyards and takes the load. Self tailoring winches make it far easier. A winch handle slots into the top for easy winding. The wind dominates the behavior of a yacht; it is what propels it through the sea, so when it comes to sailing terminology the ‘points of sail’ have their own names. No sail zone – A yacht cannot sail into the wind or 45 degrees either side so this is when the wind is on the bow. Run – Is to sail with the wind coming from directly behind, on the stern. This is when you often see a large balloon shaped sail, light, and sometimes very colorful which is called a Spinnaker. 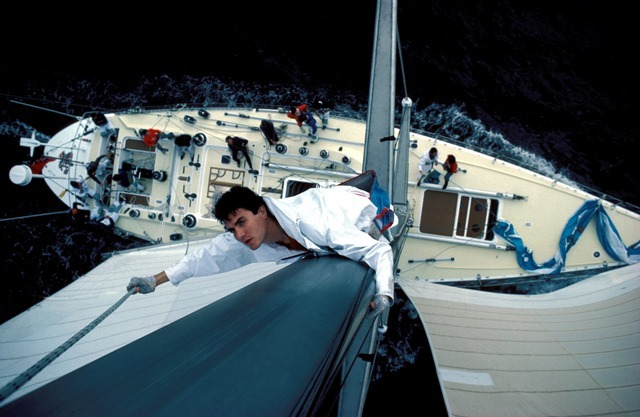 Close Reach – sailing upwind at an angle less than 90 degrees. Beam Reach – sailing directly across the wind at 90 degrees. Broad Reach – this is sailing downwind at an angle greater than 90 degrees from the wind. Other sailing terminology and sailing equipment you should know when entertaining the world of sailing is a rope may not actually be called a rope! It can be called a …..
Sheet – this is the rope attached to the sail or to the boom, enabling the sale to be controlled, and ‘trimmed’. Halyard – this a rope used to hoist and lower sails. 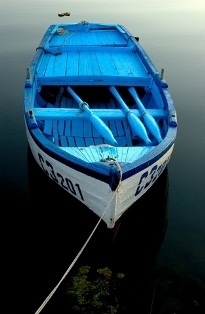 Painter – the rope attached to the dinghy or ‘tender’ so it can be towed or made fast. There are other nautical terms with a number of interpretations such as …. Berth 1 – a place occupied by a boat in a harbor. Berth 2 – to moor a boat. Berth 3 – a sleeping place on board a boat. Beam 1 - The maximum breadth of a boat. Beam 2 - A transverse member which supports the deck. Beam 3 - On the beam means that an object is at right angles to the centre-line. Anchor - A heavy piece of metal that is used to secure a vessel at a point. Apparent Wind - The wind that you feel on your skin when you are moving it is a combination of true wind and that created by the movement of the boat. Aback – Describes a sail when the wind strikes it on its lee side. Aft – At or near the stern. A-hull – To ride out a storm with no sails set and the helm lashed to leeward. Beating - Around 40 degrees from the wind. Almost head to wind. All sails in tight. Back a Sail – To sheet it to windward so that the wind fills it on the side that is normally to leeward. Backstay – A stay that supports the mast from aft and prevents its forward movement. Broach – When a boat running downwind slews broadside to the wind and heels dangerously. It is caused by heavy following seas or helmsman error. Buoy - An anchored flotation sphere used to mark a position in the water. Bimini - A cover of a canvas material that shelters a cockpit or other area to provide protection against the weather. Capsize - When the boat turns over 90 degrees to windward or leeward. Catamaran - A twinned hull boat with no centre-board. Close Haul - 45 degrees from the wind. Sails out a quarter. Crew - The person holding the gibsheet and controls the centerboard trim. Also controls the spinnaker or gennaker. Clew – The after, lower corner of a sail where the foot and leech meet. Cotter pin – Soft, metal pin folded back on itself to form an eye. Dinghy - A small boat capable of supporting a few people; mostly used for taking people between the main vessel and shore. Deviation – The difference between the direction indicated by the compass needle and the magnetic meridian; caused by metal objects aboard. Drogue – A sea anchor put over the stern of a boat or life raft to retard drift. Eye of the wind – Direction from which the true wind blows. Fix – The position of the vessel as plotted from two or more position lines. Forestay – The foremost stay, running from the mast head to the stemhead, to which the headsail is hanked. Gybing - Turning a boat's stern through the wind and changing direction. The sails, the crew and the helm change side. Goosewing – To turn the boat through the eye of the wind to change tack. Heel - The boat turns over onto its side, because the weight distribution is not correct. Knot (Nautical Mile) - Means 1 nautical mile an hour, which is roughly equivalent to 1.15 miles per hour or 1.852 kilometres per hour. Leeward - Closer to where the wind is going. Reefing - The process of reducing the mainsail's sail area in strong winds. Then the sailing terminology you may be more familiar with. Like the galley, yes, the kitchen, and the head is the toilet. And of course you have the cockpit the place you most often sit in. The companionway and the hatch are two holes you could fall into both leading into the cabin. The skipper is quite likely the helmsman, some times referred to as the ‘nut attached to the rudder through a steering mechanism.' Now I am properly confusing the novice sailor. At the Yacht Club it's easy to tell a fellow sailor 'You're on the hard because you have a dirty bottom,' it's all about understanding sailing terminology and sailing equipment. And in the end that is what's important ... understanding and being understood. For your safety and others! Like any new language learn a few words at a time and progress from there. 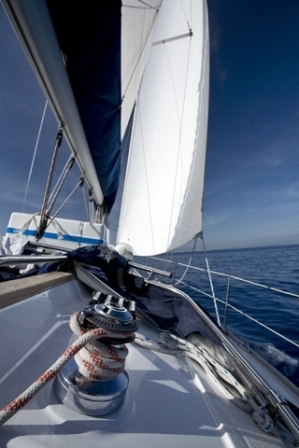 Knowing the basics of sailing terminology will help if you are learning to sail! Go to Learn to sail!